Sunset over Mooselookmeguntic Lake at the Height of Land overlook on Route 17. 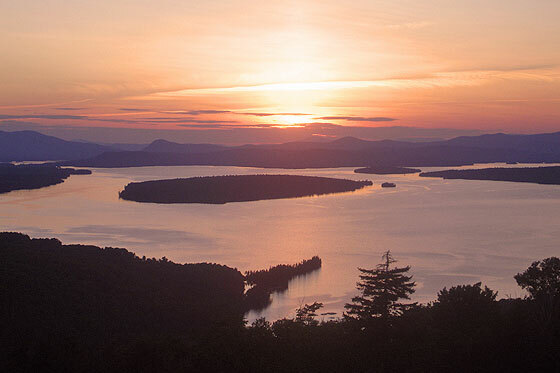 Catch a glimpse of the Rangeley Lakes Region from the air and you’ll see lakes and pocket ponds fanning out in all directions. Cobalt blue waters contrast with the deep green forests and half-hidden villages. The forested coastlines and blips of islands are enhanced in the fall by an expanded palette of reds and golds. This is Rangeley Lakes, Maine, paradise for man and moose. Man comes to fish the waters, tee off on golf courses with eye-popping water views, hike the mountains in summer and ski down those same mountains in winter. What’s in it for the moose? An endless buffet of munchable water plants from one end of Rangeley Lakes to the other. Winter in Rangeley Lakes means white powder at Saddleback Mountain and downhill skiing at its best. It’s also the time where the Cross Country Ski Center in the town of Rangeley becomes the focal point for cross-country skiers. The more than 62 miles of hiking trails over land and lakes provide plenty of elbow room for some serious exercise. More than 100 miles of snowmobile trails are also available. Spring kisses the ice goodbye and says hello to kayakers, canoers and boaters wanting to do a bit of salmon or trout fishing, bird watching or just take in the scenery. The wildflowers are in full bloom, the loons are nesting and the moose start appearing along the roadways. Summer brings the opening of the Mingo Springs Golf Course and the Evergreen Golf Club, along with increased enjoyment of the lakes and forests. The Rangeley weather offers plenty of sunshine and lots of opportunities for a swim and a tan. Fall is the time when Mother Nature pulls out all the stops. The trees are on center stage, brilliant with their leaves of reds, golds and oranges. It is a photographer’s dream. This is also the beginning of hunting season, a Rangeley tradition. The town of Rangeley offers lodging in iconic inns like the Loon Lodge or the Rangeley Inn. Other options include B&B properties, motels or campgrounds for tents and/or RVs. Rangeley’s vacation rental agencies offer private cottages, cabins or condos. If Saddleback Mountain is your winter destination, some rental homes and condos offer ski-in, ski-out access. Remote sporting camps combine the chance to get away from it all with a bit of hunting, fishing or wildlife watching. Pick your season, your favorite adventure, and then decide what type of Rangeley Lakes vacation suits your personality.